FREE TO AIR RF TUNER TO IPTV GATEWAY HEADEND. 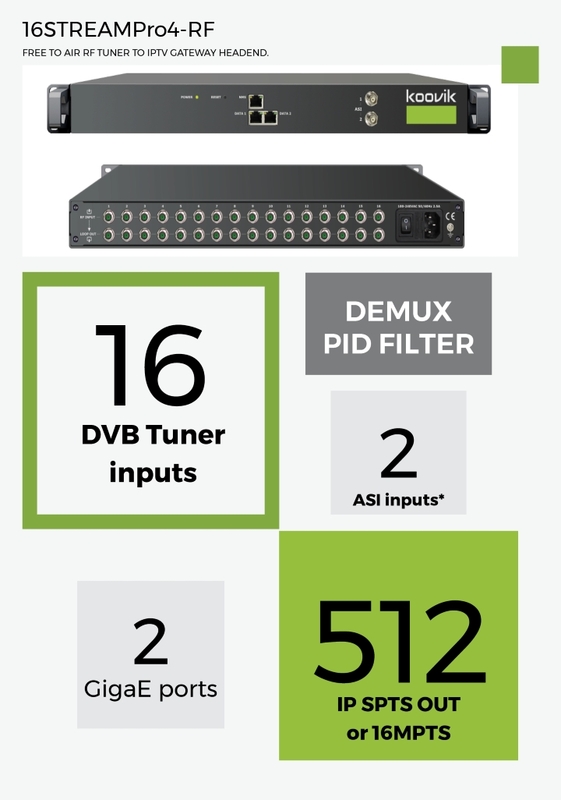 16 DIGITAL SATELLITE, TERRESTRIAL or CABLE INPUT TUNERS. ASI INPUTS for feeding in local programs/services. Up to 512 SPTS with program demux PID filtering and re-mapping. UDP or RTP/RTSP. Unicast or Multicast. Or 16 MPTS streams passthrough with NULL PKT filter outputs. UDP or RTP/RTSP. Unicast or Multicast. Free to air programs or BISS decryption. descrambling BISS Modes BISS-1 and BISS-E. Max. throughput 600 Mbps. Max. 256 BISS keys. SET-UP NMS Embedded web server (English). Local and remote.